Thank you all so much for your kind thoughts for Bernadette and I. I spent a short amount of time with her yesterday because she was too weak for more and as she asked for a visit from a priest, I arranged that. I'll go back this afternoon after work. Last night's dinner - small sweet potatoes, turnips and cabbage, with a pork chop. Getting back into my work here made a big difference to my frame of mind but I couldn't clean the bathroom out properly as Hanno was still working in there when I returned from my visit. I watched a free DVD with Tricia instead. A French film, Amelie. We both loved it. 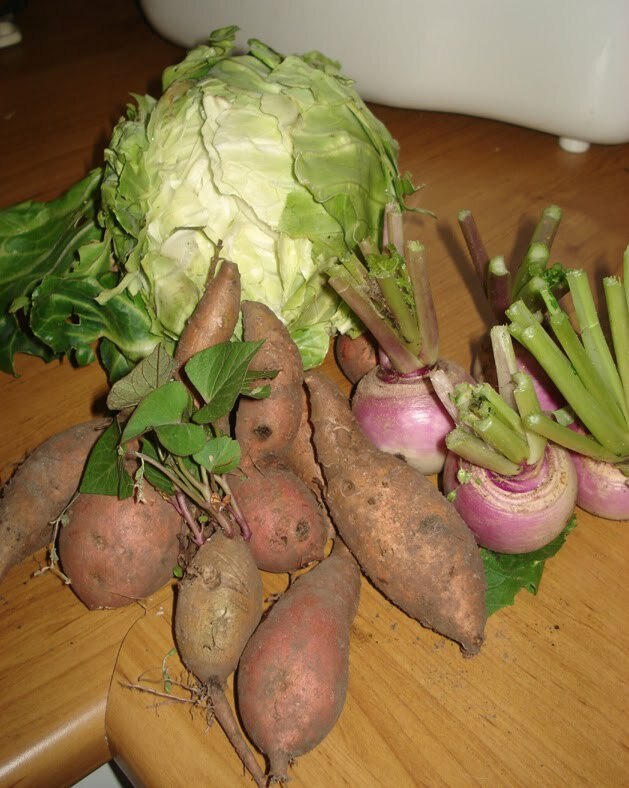 After that I picked vegetables for our tea and prepared a feast of sweet potatoes, turnips, cabbage and a pork chop each. Dessert was creamy rice pudding with stewed apples. A hearty dinner enjoyed by us all. It is very gratifying to eat organic food picked from the garden that is cooked and on the plate a couple of hours later. While I wandered around the garden, I noticed the potatoes are growing well out there, the tomatoes and cucumbers too; it's only a matter of time before they are on our plates. I wrote about warming winter soups last week so to balance the equation, I thought I'd remind our northern hemisphere friends about cooling summer drinks. I was prompted to do this because in our front yard, a pineapple is growing. Many of you will remember the pineapple I grew in the backyard. Well, we transplanted it when we cut the pineapple to eat, and planted it in the front yard. Pineapples are slow growers and take up a fair amount of space - we needed it out of there. It took its own sweet time but true to form, the pineapple produced its second fruit. 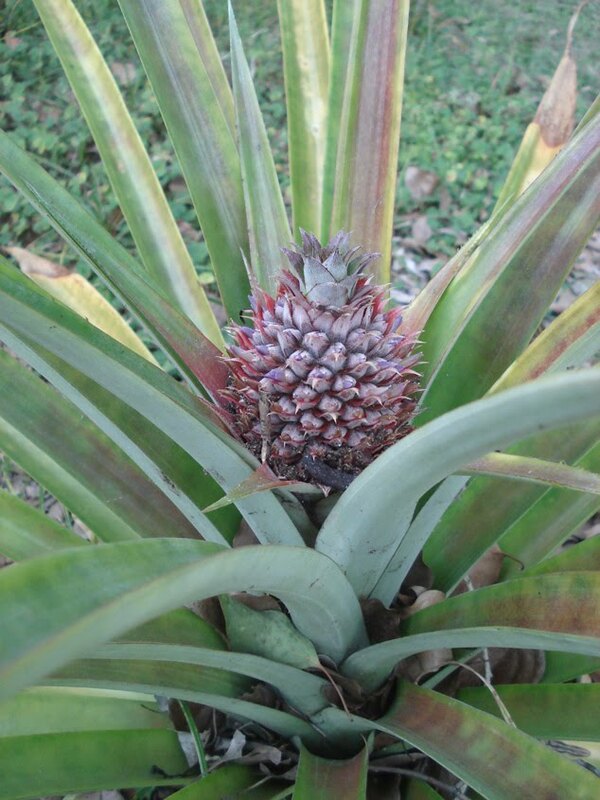 When this pineapple is ripe and picked, the plant will have done it's job and will be pulled out. Home grown fruit - it's organic and the sweetest fruit you can imagine. We also have oranges, lemons and passionfruit growing at the moment. If you have a bit of land, I encourage you to grow whatever fruit is suited to your area. Fruit trees take some time to establish but when they are they're relatively easy to grow and produce such wonderful crops. We will be eating this pineapple next summer. Of course the best drink anyone can have in all kinds of weather is spring water or tap water that is filtered. We have filtered tap water here and I try to drink about two litres/quarts of it every day. Some days I'm better at it than other days, but I get close most of the time. Throw in a lemon wedge of a squeeze of lime with a few ice cubes and you have a drink any visitor would be happy to be offered. If you want to go a bit further, or if you have children who prefer soda or soft drink, maybe one of these recipes will tempt them. They will still be drinking a bit of sugar (although not as much as any fizzy drink or pack of commercial juice) but there will be no preservative, artificial colourings or flavours, and no chemicals whose names you can't pronounce. All it is is the juice of whatever fruit you have on hand, mixed with a sugar syrup. You control the amount of sugar in the syrup. This week's flowers - dill flowers. This is just equal amounts of water and sugar. So if you mix 2 cups of water with 2 cups of sugar you'll have one litre/quart of sugar syrup. Just add the amounts to a saucepan, bring to the boil and simmer, stirring, until the sugar dissolves completely. Allow it to cool. BTW, if you want to make a weaker syrup, go for it. That is one of the benefits of making your own summer drinks, you decide how much sugar goes in. Here are some of my recipes for cool summer drinks. Please note that if you can't find citric or tartaric acid at the shop, leave them out. They are natural fruit acids that help with storage of the cordials but aren't necessary for the taste. Because off the sugar content, the cordials can be stored in the fridge for at least a week. Remove the top (if you have a garden, plant it) and skin from a ripe pineapple. Cut it into pieces and add to the blender. Add about a cup of sugar syrup and blend. When the pineapple is crushed, add cold water and more sugar syrup to suit your taste. Serve with ice cubes. If you have children who like fizzy drinks, serve them ginger beer. When you make this you're entering into the wonderful world of fermentation. This is a healthy drink that most of our grannies would have made. My post about ginger beer is here. Adults will enjoy ginger beer too. An article about homemade ginger beer. So, there you have it. A range of fruit and spice drinks to serve your family and guests. With the addition of tea, coffee and water, you'll be able to offer refreshments you'll be proud of that contain no hidden additives. I love the drink recipes. I have never heard of ginger beer, I must try! thanks!! Rhonda ,your dinner sounds grand,no food miles in that one.I did'nt know that you just plant the top of the pinapple.Thanks will try one soon. I make a cordial that my grandmother did where you add lemon essence and tartaric acid. I also have made passionfruit cordial, rosella cordial and now that it is citrus season, lemonade and orangeade. I have a very old favourite (great grandma's cook book) which the kids love. I make it in bulk so it sounds like a lot of sugar but you can dilute it down heaps. All you do is peel 9 lemons and boil the peel with 3 kilos minus 2 cups of sugar (how much water you use is really variable - it just needs to melt the sugar enough. I usually end up with about 7 500ml recycled beer bottles). Let it cool and add the lemon juice. Also add a tablespoon of epsom salts, ditto of citric acid and ditto of tartaric acid all dissolved in half a cup (more or less) of boiling water and strain and bottle in glass. I usually add a couple of slivers of the leftover peel to the bottles. I have used other fruit too. The one thing you can't leave out is the epsom salts. Thats what gives you the cool feeling when you drink it. What an absolutely fabulous blog.One of the best ones...no the best one in my humble opinion. I have just come across it today and regret every moment I've not known about it. I have just acquired a new laptop and you will definately be my bedtime reading from now on. Thankyou..you have made my week. I'm so sorry to hear about Bernadette. It's hard to watch a friend suffer. Thanks for the recipes/suggestions - I have 2 boys that are not keen on water at all (but they have to have water for school) and our budget doesn't allow constant squash/pure juice etc so we have all agreed to compromise on juice at meal-times and water at other times. However it is getting very difficult to find squash in the UK which is made with sugar rather than artificial sweeteners (due to the general belief that sugar is "bad" for you - I would much rather consume a small amount of natural sugar than an artificial substance!) so making our own meal-time cordials or ginger beer is on our to do list. Sorry to hear about your friend. Did you catch Australian Story on Monday night? Watch it - it will have you in tears, but will uplift you I think, and help you appreciate your privileged position at this time. Praying for Bernadette, and comfort for you all. Oh, the descriptions of your pineapple and citrus are mouth-watering! 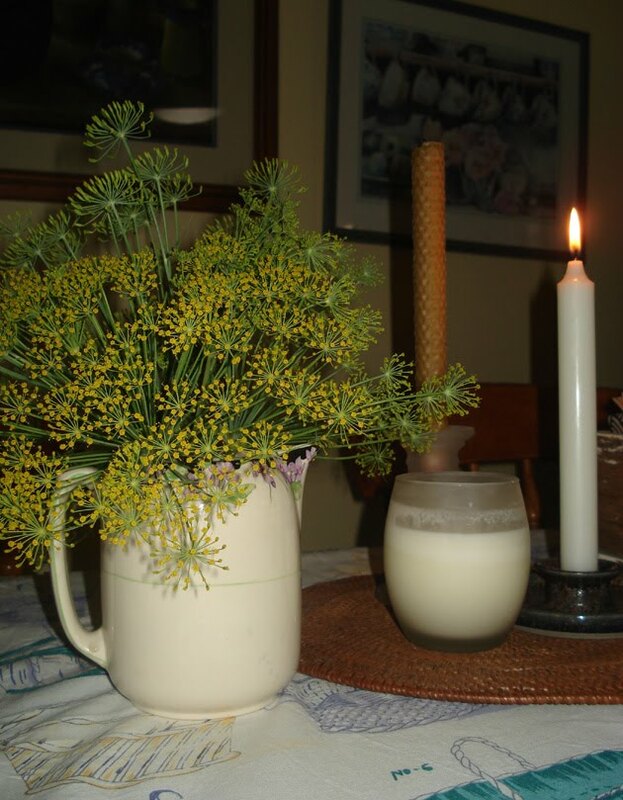 The picture of the Dill Flowers is gorgeous. Bless you for the precious care you are giving your dear friend. Even though it's miles away, please tell her we send our love to her. We drink a lot of sun-tea. Put black tea bags in a large jug of water (I use 4 bags) cover, put in the sun for several hours and then in the fridge. Some people put sugar, lemon, mint in theirs I prefer it completely plain. Frugal, healthy and delish. Ginger beer is one of my very favourite drinks. What wonderful looking produce in that picture, Rhonda. Continuing to think of you as you support your friend, Bernadette. Thank you for the drink recipes. It is very hot here in Texas and they sound yummy! Keeping you and Bernadette in my prayers. I'm going to have to make that pineapple crush business! That sounds SOO GOOD!!!! I'm with Karen. Love the blog! So many fun topics. I can't believe you can grow pineapples!!! I'd love to grow pineapples. And mangoes. Mmmm. I've been reading your blog for some time now and I never think to comment, so I wanted to take a moment to say thank you for all the time and effort you put into your blog and helping folks lead simple and rewarding lives without over consuming. I am trying your ginger beer recipe for the first time. We have made ginger beer with commercial yeast before, but not like this. So here are my questions. Do you keep your jar covered with loose cover at night and leave it wide open during the day? Since we have lots of kids and animals, would it work to leave a loose cover on all the time? Do you sterilize your plastic bottles or just make sure they are clean? Dissolve 4 cups sugar in 4 cups boiling water add 1 tablespoon citric acid and grated rind from 6 lemons, when cooled add juice of the 6 lemons strain and cool.